Finally! We've found a (delicious) use for the juice in that jar of maraschino cherries. Add it to this limeade punch for great color and flavor. Slowly pour soda into a 2 gallon pitcher. Add cherry juice. In a bowl, whisk together warm water and drink mix. Add mixture to the pitcher and stir slowly. 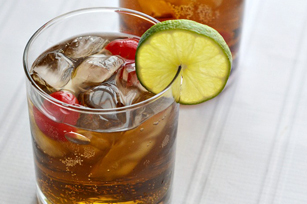 Serve over ice, with cherries and a slice of lime.